We recently launched “The COSA Measuring Sustainability Report.” together with five The timing is fitting as food companies increasingly join governments and developments agencies to invest in more COSA Measuring Sustainability Report is a result of our seven year collaboration with many organisations and experts to evolve a common set of practical indicators and metrics to improve the understanding and management of sustainability efforts. Below is an overview of our report and I invite you to comment or participate in the ongoing work. There are many paths to achieving sustainability. To choose the best one it is necessary to measure results in a reliable and yet cost-effective manner. COSA, working together with many global partners, offers science-based insights and managerial tools to make the future of agriculture a more sustainable one. 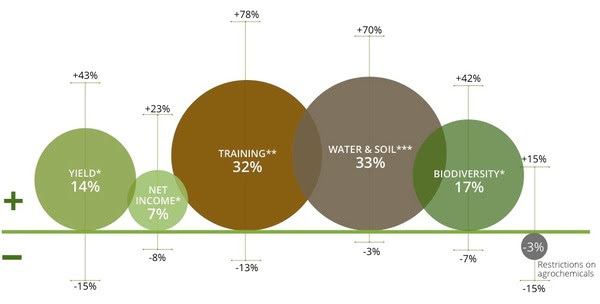 The influential and explosive new trends in sustainability are laid out in sustainability of farmers, communities, and the environment in transparent and standardized ways. 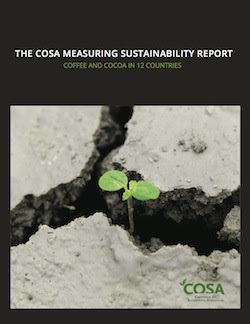 The rationale for COSA explains the history, basic structure and unique approach to measuring sustainability. It includes an outline of the COSA System. COSA uses a coordinated and systematic approach to collect and analyze data recognizing that Performance Monitoring and the Impact pathways are vital stages for understanding sustainability and managing for results. Arranged by Economic, Social, Environmental and Producer Group findings, this section of the report presents a sampling of the many ways that COSA information can be useful. It includes useful lessons and surprising findings gathered from Africa, Asia and Latin America. Sustainability Standards play a unique role in a fast-changing agricultural landscape affected by diminishing resources, climate change, and population pressures. However, only a small part of the ?nancial value that they generate actually reaches producers. It can be difficult to ascertain which approaches warrant the cost and effort of compliance. The promises that circulate of insatiable markets and high premiums are not certain and local institutional support is invaluable when undertaking sustainability approaches that entail change. Many Voluntary Sustainability Standards are investing in balanced sustainability indicators, as ISEAL and others are recommending, can advance transparency will be useful for the process of improvement.